The premises of the trader and the investor with regards to how each views their gains, are distinct from each other. 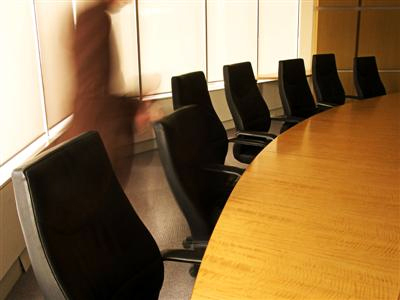 These significantly impact each of their buying and selling behaviors. All in for predictability of business gains. The consistency inherent in excellent companies makes owning them bankable and scalable worthy of an investor committing and tying serious amounts of money indefinitely. On one hand, a trader takes on the perspective that his returns are ultimately dictated by stock market capital gains (i.e. trading gains), and therefore, it shall only be necessary to buy and sell (i.e. trade) a stock position. 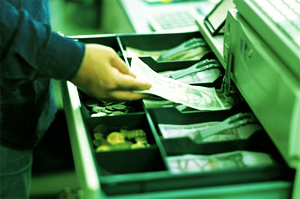 The activity necessitates active management of cash/liquidity; naturally, the trader is concerned of being liquid in the end of the day (or week, or depending on his trade plan)—that is, being able to eventually close his stock positions and have them in liquid cash at his disposal to execute new trades. It is a relentless pursuit. That being the case, the trader cannot help but be always reluctant of committing serious amounts of money when executing a certain trade or play, because of the unpredictability of the schizophrenic market that is driven by the emotions of fear and greed. Let Management do the heavy-lifting. Publicly-listed companies already have that bonus of having management teams run the business. An owner/entrepreneur should aspire the same thing for his private business to free him up from the day-to-day grind of operations, and make him focus more on being an investor concerned of profitably allocating capital. How many times have we seen thriving businesses which come to be just that—small businesses? The owner/entrepreneur's time has been so caught up with active involvement in the day-to-day operations that overlooked are the possibilities of automation and delegation. Other opportunities of profit-making ventures are neglected, too. Virtues of industry and hardwork are important. But if one intends to make a business expand, prosper and make a lot of dough in the process, there should also be that added element of delegation. One can be business-minded, conscious, and concerned about his company's operating realities, but it does not mean he has to be necessarily actively and always engaged in its day-to-day operations. Note: The following is a letter addressing my partners which clarifies the money-weighted (MW) and time-weighted (TW) measures of performance. I would recommend that you read first the earlier letter before proceeding. The Money-Weighted Rate of Return. This rational measure of performance tries to capture the internal rate of return (IRR) of the portfolio. It is therefore sensitive to the timing and size of cash inflows (outflows) and accurately depicts absolute returns per actual fund results. My January 12, 2011 letter presented how my personal portfolio has yielded since its inception in 2008. My number-crunching, while honest and innocent, failed to mention two ways in which fund returns maybe measured: the money-weighted (MW) and time-weighted (TW) approaches. For everyone’s information, the 17.15% rate of return previously presented considered the time-weighted method. Through this letter, I intend to further delve into this issue of measuring performance. I cannot overemphasize the importance of this matter to the investing partner; although I have to apologize in advance should this presentation be too technical. Essentially, TW captures this scenario: had I started the fund with a pioneer partner in 2008 and that partner did not make any deposits to and withdrawals from the fund, he should be earning a 17.15% compounded annually. 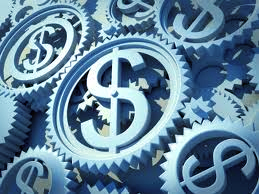 In reality, however, this may often not be the case: he may be making additions or withdrawals (these can dramatically magnify his profits or losses depending on how the fund performed after the additions/withdrawals)—this is the essence of the MW approach; it captures and weighs the timing and money amounts committed for any given period and pinpoints the real absolute returns per actual fund results. 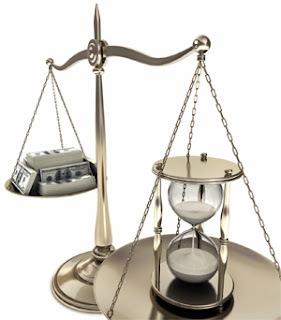 The Time-Weighted Rate of Return. This rational measure tries to capture the fund performance in terms of simple, periodic returns, discrediting the distorting effects of infusions and withdrawals. Late last year, I began a private investment partnership (in common parlance, a hedge fund) with some friends and family members. Although the original plan for the partnership was to carry it on indefinitely as a going-concern, my partners and I were forced to liquidate it just recently because of personal constraints (this is another story). What follows are two letters addressing my partners on the subject of measuring performance. The first letter tries to explain my personal fund’s time-weighted performance (although it didn't explicitly tell I was using TW; I still had then the faintest idea of using the MW approach and thought that TW is the only correct way of presenting and measuring returns). The second letter explains the MW approach; there, I tried to explain and reconcile the differences between both approaches. Note: For privacy and other reasons, while my portfolio's starting capital is presented below to be Php100,000, this isn’t the exact, actual amount; accordingly, succeeding deposits (withdrawals) and gains (losses) are proportionately adjusted. Rational Measures of Portfolio Performance. The Time-Weighted and Money-Weighted rates of return are two standard rational measures of portfolio return. This Part 1 of a Series. It was sometime early this year when I finally decided to bring unto myself the task of measuring the rate of return achieved by my personal portfolio. The whole idea intrigued me—I knew it's making some money, but knowing how much money—well, that really captivated my imagination. I know the exercise was somewhat hypocritical... I preach business perspective investing which always focus on the financial performance of the stock based on its merits as a true, performing business, and give little or no value to how its stock market price performed. While I admit I measure my portfolio’s returns based on stock price performance, and that this is my yardstick as a market-conscious fund manager, I likewise admit and insist (and I don’t see any inconsistency in saying) that in my career as a rational investor, my focus, nonetheless has still been and always will be the virtues of the underlying business. Further, I see that using and practicing value investing principles in managing my portfolio is an experiment and a profitable endeavor altogether. It is an experiment which tests whether this premise is true: "that the market may take an inconveniently long time to adjust to a rational valuation; (we) don’t know what the mechanism is, but (we) can tell that in our experience, it usually does readjust eventually" – Benjamin Graham on the market being rational (taken from the book Warren Buffett: An Illustrated Biography of the World’s Most Successful Investor). Equity Bond. A stock can likewise be thought of as a bond whose worth is just the sum of all its discounted free cash flows. The difference from your regular bond being: the equity bond yields expanding coupons! Following the line of rational thinking usually applied in bond valuation, a business, in the same manner, is only worth all the discounted future cash flows it can provide. A business, therefore, can be thought of as an “equity” bond. The question now is: which cash flows should we consider and discount? An extreme take on this paradigm is the Dividend Discount model. Taking on the assumption that the significant cash flows are only those dividends actually paid to the shareholders, the model intends to value a stock based only on these dividends. The immediate problem on this extreme view is how detached it is from the real, internal cash-generating capacity of the business. For one, it can be deceptive since dividends by themselves say nothing of the operating realities of the underlying asset—they can even be financed through externally sourced debt at the immediate pleasure of naive, detached “owners”, but at the immense detriment of long-term, business sustainability. Another reason is that, there's also those companies which are really good at making money but are not in the habit of disbursing them as cash dividends. It's not that they don't want to share the profits, but that even the board of directors and the shareholders favor income retention because management is capable of further deploying these profits in investments that would further compound wealth. The intrinsic value of an asset is only worth the sum of the present values of all the future cash flows it provides. This is the assumption of bond analysis and valuation. When you buy a bond, you are offered interest or coupon payments which you receive in varying intervals (e.g. monthly, quarterly, semi-annually, annually, etc.). You pay upfront for the principal, receive interest payments, and finally receive that principal you initially paid for upon maturity (i.e. expiration date of the bond). Coupon Bonds. In bond analysis, a bond is only worth the sum of the present values of all its coupon payments and principal upon maturity. 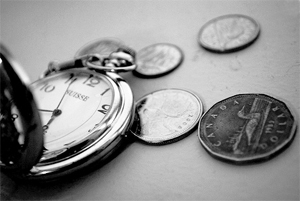 What is Present Value? It is the discounted value of a cash you’d be receiving in the future. It is based on the premise that as rational capitalists, we give more value to cash we can hold, spend, or invest now (at the present time) than the same cash amount we would receive in the future. It does make sense if we observe an extreme example: were you offered a million pesos, would you rather have it now or have it 10 years later? Most definitely, that Php1M is worth more to you now than it is (at the same amount) 10 years after! How about Discounting? Discounting is a technical, finance-slang term akin to your more familiar, layman’s interest rate. Say you have a Php100 and you offered it to me as a loan with 10% interest per annum. After a year, assuming I stay true and make good our original terms, your Php100 would be worth Php110. This is Part 3 of a Series. Go to Part 2: So Where Have All Those Free Cash Flow Gone? 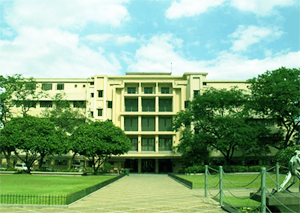 Majestic Campus. FEU is one of those few quality businesses that routinely produce and hoard free cash for the wealth enrichment of its owners. I can’t blame anyone who thinks school is boring. Be it on what one may have experienced back in high school or college (e.g. boring classes and teachers/professors), or in stocks (i.e. boring, illiquid issues that hardly move in the market). But let’s take on the shoes of a prospecting investor interested in the fundamental cash-generating dynamics of a school as a business. Disclosure: I'm currently a shareholder of Far Eastern University—yes, it is listed in the Philippine Stock Exchange (PSE: FEU). Grasping the core business model of a school seems easy. Schools teach and prepare students for the real world, and in return collect tuition fees for this education service. As many are aware, they collect these fees upfront; before a student can walk into a classroom to learn, he must first pay the registrar a visit and write the accounting department a check. Not mentioning its other sidelines (such as leasing certain properties owned and deploying excess cash into other non-core business investments), that's how a school primarily makes its money. So Where Have All Those Free Cash Flow Gone? Flow Accumulation. Doesn't the thought of where free cash flow has been accumulating merit contemplation? A company’s cash hoard is similar to the idea of accounting profits being accumulated in equity’s retained earnings. In this case, however, we're talking money—that is, cold hard cash, not booked accruals, or capitalized expenses. If one is so conscious about observing free cash flow and one subscribes to the idea of it being the true measure of cash profits, the more so should be with how and where it accumulates. That is, that “free cash equity” base where all those free cash has accumulated. Free Cash Assets – they include cash & cash equivalents and non-core business investments (stocks, bonds, real estate, etc. )—these are the primary free cash flow outlets—the asset base of cash hoard. Capex Assets – while these are investments on enterprise infrastructures, these are actual cash outlays. Trade Assets – these are accounts receivables (accrued sales which are yet to be collected), and prepaid expenses and deferred tax assets (actual cash outlays). 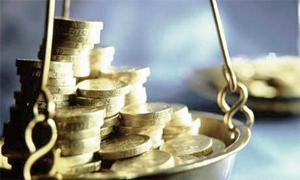 Ultimately, the industrialists, the rich, or the wealthy want to see a certain build-up of cash profits (i.e. free cash flow) in their businesses. This is despite all the demand of large cash outlays to maintain their respective core business operations. They try to achieve and maintain this liquid financial state so they can pay themselves (e.g. dividends, share buybacks) or further reinvest those free cash in other cash-generating assets (e.g. acquisitions of whole businesses, non-core business investments). Like a small seed growing into a large fruitful tree, small humble businesses, producing hoards of cash, turn themselves into large holding companies owning several other businesses. These subsidiary businesses, which eventually produce even more cash themselves, enable the corporate group to acquire even more businesses, compounding wealth at an accelerating speed. 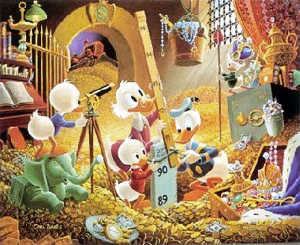 Uncle Scrooge McDuck's Cash Hoard. 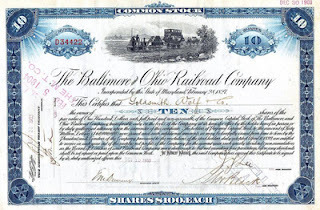 While the word "hoard" or "hoarding" evokes images of wealth and riches in the forms of gold coins, jewelries, and other valuable/rare items, in the real world of business, these are in the forms of cash, investments in real estates, ownership of businesses/stocks, bonds, and other liquid, marketable assets or other cash-generating assets. This hoarding nature of excellent, money-making companies can be attributed to their unwaning generation of free cash flow which has accumulated in the midst of the enterprise. Its accumulation, thus, would indicate a business well positioned to propel itself, as it utilize those hoarded free cash to exploit shareholder value-enhancing opportunities. I will be discussing a self-contemplated financial concept I shall be referring to as “Corporate Cash Hoard” or simply, “cash hoard”, “free cash hoard”, or “free cash equity”. It is a theory which picks up from where the idea of free cash flow left. It is not intended to replace your usual standard accounting/finance balance sheet framework (particularly familiar accounts such as current assets, non-current assets, current liabilities, non-current liabilities); what it intends to offer is a cash-bias perspective on the overall “free cash” financial standing of a firm. Before you continue reading, I’d suggest you read through my Cash is King blog series. That’s gonna help provide some basic understanding and, hopefully, useful insights on how to visually observe how a business internally generates its cash profits. The concept of the corporate cash hoard is founded on the idea that: With free cash flow being continuously produced by a cash-generating business, it’s got to be accumulating somewhere in the balance sheet. The question is, where have all those free cash flow gone? Thus, although I would refer to it as “cash hoard”, this shouldn’t be confused with the cash & cash equivalents asset account under the balance sheet. Continue to Part 2: So Where Have All Those Free Cash Flow Gone? Seeing the Money Machine in Action. The Direct Method of Cash Flow Statement cleanly illustrates where and how money is paid and made in the business. Now imagine an Operating Cash Flow statement which can tell you, spot on, the cash receipts coming in, and cash disbursements going out, in an organized way similar to the kind of intuition you get when you look at the Income Statement. 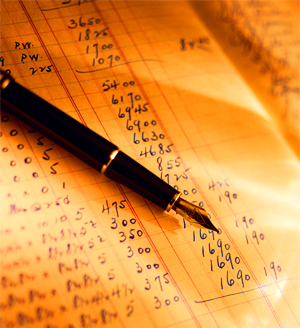 This is the Direct Method of Cash Flow Statement. So you’re telling me there is such a thing called Direct Method of Cash Flow Statement? Yes. Then why hasn’t this been used in the first place? I’m not so sure myself (I'm curious, too, so you may comment below or message me if you know why). 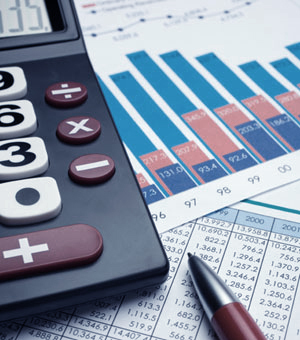 Companies and regulating government agencies seem to prefer the Indirect Method of Cash Flow Statement because of how it readily reconciles with the Income Statement’s Net Income. After all, because of the reconciling adjustments, it actually holds information you need to convert it into a Direct Method. Its proforma just needs a slight overhaul and reorganization to be easily understood. And that’s just exactly what we’re gonna do and demonstrate. Note: When looking at the Cash Flow Statement, generally, a positive (+) number means a cash inflow while a negative (-) number is a cash outflow. This may not be true, however, with Operating Cash Flow reporting under the Indirect Method; the positive and negative numbers may not be actual inflows or outflows but just adjustments (don't worry, this will be further discussed). The Cash Flow Statement—you know it’s there, reported as one of the primary financial statements filed by a listed company. But let me ask you, why, for the love of finance, do we not look at it as much as the Balance Sheet and Income Statement?! It lacks that clean appeal of the Income Statement! It’s just not as intuitive. The Natures of Cash Flow: Operating, Investing, and Financing. Of these three, Operating Cash Flow makes explicit that money-making ability of a business. Photo courtesy of LitratoNiJuan. Then again, you have to give credit to it for delineating the natures of cash flow into three basic categories: Operating, Investing, and Financing. Of these three, the internal cash-generating capacity of the business can be observed under Cash Flow from Operating Activities. This is where the money-making faculty of a business is most visible and this is where you want to focus on. It includes collection of revenues, payments of inventory to suppliers, and payments of operating expenses—the very heart of the going-concern business: collecting, paying, and ultimately, milking profits into cash. This also captures all cash gains and losses realized whenever fixed assets (i.e. capex) or other investments are sold (further discussed under Investing Activities). If its ending net figure is a large positive number (approximate or even larger to Net Income), you know that the business is indeed raking up not just profits, but cash profits. It’s what makes a business a money machine. 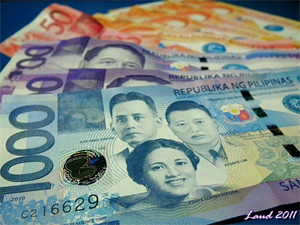 Cash Flow from Financing Activities, on the other hand, identifies the cash financing aspect of the company. This includes cash externally sourced from investors or creditors (existing or new ones) or those withdrawn by them. Here you can also see loans being paid off (but not inclusive of interest payments since these are already captured under Operating Activities), as well as dividends distributed to shareholders, cash paid for share buybacks, etc. 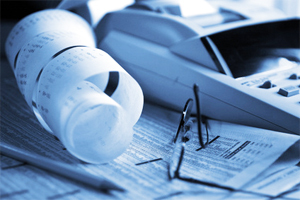 The Income Statement is a handy-dandy financial statement readily available and can be used easily to evaluate a firm's profitability. It cleanly breaks down the revenues, direct expenses, gross profit, operating expenses, and net income. 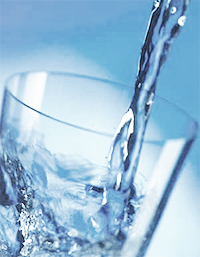 However, it falls short of presenting the whole picture in terms of a firm's liquidity. Liquidity is a financial concept that measures and captures a company’s ability to collect cash revenues and pay off cash expenses. Not just profitable, but liquid. Quality businesses demonstrate their superior economics if they are able to maintain a healthy flow of internally-generated cash. The Income Statement can't show that, so you need to cash qualify it with the Cash Flow Statement. The Income Statement doesn't tell you what portion of the revenue is actually received in cash or how much cash was paid for purchases of inventory and for operating expenses. Let's admit it, although accrual accounting (which is the basis of the Income Statement) is very useful and clever—and may I note, probably one of the best inventions of mankind—it can be, sad to say, misleading or deceiving. I say this because a company may indeed be profitable, but is not realizing those profits in cash. That’s the role of the Cash Flow Statement; it can be used in conjunction with the Income Statement to qualify cash transactions, and ultimately, cash profits. The Color of Money. Businessmen and entrepreneurs are instinctively money-conscious. They are very mindful of not only profits, but cash profits! I've always admired businessmen or entrepreneurs who have not a clue or idea about the stock market, but when they start speaking about their private companies, you can visualize the excellent fundamentals, and cash-generating power of their business models. They have a quick eye on the things that matter—they are mindful of large expenditures and always expect return benefits from cash outlays (such as an investment on an equipment and the potential savings it eventually brings). They hardly talk about accounting profits; instead, they focus on cash flow and return on investment. It’s reminiscent of that business-minded, typical Pinoy concern of "Magkano ba kikitain ko jan?" When you hear him ask that, you know he's concerned about how much cash he will get in the end. Money begets money. The compounding power of stocks can be observed in its underlying business' return on equity (ROE). Like an interest rate in a bank, the higher it is, the more the business proportionally generates wealth to the shareholder. As an investor, what you're after are businesses able to maintain the highest, consistent ROE's spanning years and decades. As a lot of fellow long-term investors are enthusiastic about the compounding advantages of buying and holding for the long haul, I began to contemplate where this compounding power is derived. Most would try to express this magical stock attribute in market terms—they’d pick a stock which has performed considerably well and then easily point out the stock’s market price in two points in time (e.g. had you bought some shares of Company A at a certain price a decade ago, held on to it up to this day, with its stock now trading at this price, your holding should now be worth twice or more, compounding money at a rate above 15%). While it concretely presents the effect of compounding, it’s too bias on the market (i.e. stock price), and tells you nothing of the economic merits of the stock as a true, performing business. After all, the compounding power of stocks is found not in its stock price, but in its underlying business. Stock market transaction costs summarized. The percentage variable cost when transacting in the Philippine stock market are as follows: when buying, this is 0.295% of gross purchase amount; when selling, this is 0.795% of gross sale amount. There's practically no fixed costs. Realizing you really have to be very conscious with transaction costs since these may eat up supposed estimated capital gains in the stock market, I delved on the specifics of transaction costs. Note: This is only applicable in the Philippine Stock Market, and with my broker CitisecOnline. I discovered that overall transaction cost, be it on the buy or sell side, essentially, is a variable cost so it doesn't really matter how many trades you make since you're not being penalized by any fixed costs. This is very useful information assuming your intention is to accumulate (buy) consistently for a stock position, or to unload (sell), and you're very wary and afraid of incurring fixed costs every time you make a transaction. To those familiar with bonds, how often do we hear that when interest rates go up, bond prices go down? Why does the price of bond move opposite its yield? The relationship is naturally inverse but why?! Perhaps it's not so easy to digest because the idea of interest rates being the one responsible (or the one causing the movement) of bond prices doesn't have so much concrete/obvious logic into it. So how about putting it this way instead: Bond price dictates yield. Just like the relationship of stock price and its dividend yield, intuitively, we know that when a stock price shoots, the prospect of dividend yield drops. Let's say I'm a very popular listed company about to issue some debt instruments; I needed more capital since I'm aggressively growing my business. I issued Php 100 worth of debt (principal) maturing in 10 years at the coupon rate of 10%. Knowing that I have good credit standing making my debt or bond issues marketable in the secondary market (e.g. PDEX), you availed of all bond issues at the cost of Php 100 (it isn't at a premium or discount since your acquisition cost is the same as the original principal issue). 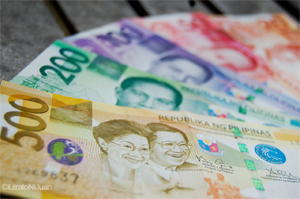 Effectively, your yield is equal to the coupon rate of 10% and you're assured of a Php 10 interest annually. Now, a friend came along and knew about the bond you're holding. He's very interested in buying it since he knows the issuer is of good credit standing. You two bargained for a trade price to where you both agreed at Php 110—he will be buying your Php 100 worth of bonds at Php 110 (at a premium). What will happen to his yield? Obviously, it will be lower. From the original 10% yield, his yield will just be 9.09%. (Php 10/110). That's why yields go up and down. For me, the yield is dictated by the price, not the other way around—although most bond market traders (being so conscious of interest rate movements) have been psyched to think otherwise. Bee Happy. 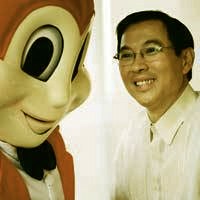 Tony Tan Caktiong's Jollibee is now larger than its "langhap-sarap" beginnings. 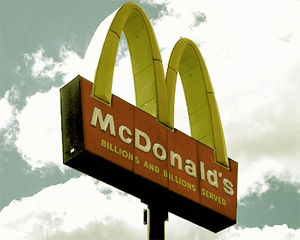 It has acquired restaurant subsidiaries and builds them into strong brands. 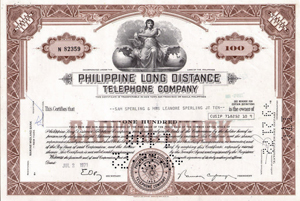 A fellow investor once raised a concern on the applicability of value investing here in the Philippines. Paraphrasing his comments: he observed that many Filipino investors try to mimic their US counterpart—then again, do we have the likes of Jim Rogers and Warren Buffett locally? It seems no one here succeeded using value investing alone. It was a good, stimulating question which challenged the universality and relevance of value investing across borders. Immediately, I tried to reflect on it. My top-of-mind recall pointed to Manny Pangilinan. I didn’t know the knitty-gritty details of his investment checklist/filters, but I thought that when his investment vehicle, Metro Pacific, acquires whole businesses, it's definitely got to be rooted/grounded on the idea of having a return on investment not by way of stock price appreciation but by way of fundamental earnings generated by the business. How does a stock market investor, as a businessman, despite all the stock market noise, immerse himself and connect his consciousness in the underlying wealth of a company he invested in? Or to ask simply, what value does he immediately get upon acquisition of the stock? Crudely, the simplest, and easiest reference of shareholder value can be observed in the balance sheet account called equity. Equity, in theory, represents that residual value attributable to owners after paying all company debts or liabilities. 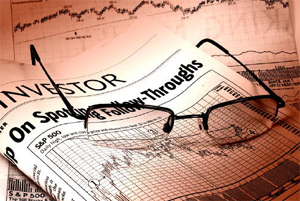 Of all measures of value, it is perhaps the most objective, readily available financial figure for the inquiring investor (in contrast to an intrinsic value estimate which may have been derived from a financial spreadsheet model which in itself is prone to the “garbage in, garbage out” risk. Value of the book. Equity value or book value is that residual value attributable to the shareholders. Increase in it through internally-generated earnings has a lot of business sense in it. The idea is to view the value of one’s interest in a business not in terms of what its stock price is doing, but in terms of what its book value is doing. With this frame of thought, you’ll have the luxury and peace-of-mind to view your wealth in book value terms, and be able to subscribe to the idea that each increase in book value enhances the value of the business. Although I am well aware there are a lot of ways to measure value (e.g. discounted cash flow model), I foster this straightforward mentality (at least for now) for the sake of bluntly psyching the price-obsessed, market-conscious investor into a simple, rational business paradigm. Focusing on equity (or book value as it is commonly referred to by accountants) gives the investor an idea or easy reference of how much value he gets from what price he pays for. Assuming this is the immediate value you get, one will have an easier time to accept that earnings—that which adds internally-generated value (i.e. by virtue of business) to book value—do really have a direct impact on the value of the enterprise, and consequently, your wealth (since you are a shareholder); thus, when the company earns, you do really have a share in those earnings. Commitment in internally enhancing book value engages the company to focus on profitable operations. Plainly, book value has a lot of business sense in it. The idea of a stock market price is precisely just that—it is something you have to pay for. You pay a price in exchange for something, which in the stock market’s case, a business. Following this line of thought, when you buy something, the intention, naturally, is to consume the product, or to benefit from its intended purpose—from its essence or reason for being. In the context of an investor, when he buys shares of stock, what does he, as a buyer of business, expect? Or shouldn't we ask first: what is the essence of a business? This is perhaps one of the most important economic questions a capitalist might ask. Here’s my take and this is only my view: the fundamental essence of a business is to consistently create shareholder value by providing products and services to continuously satisfy customer needs and wants. Hence, while the investor is compensated by profits, ultimately, the reason for being of a business is for the benefit of the ever-demanding customer. This purpose and commitment of enduringly accommodating needs and wants of customers binds that long-term quality of a business. As a result, it symbiotically becomes a perpetual repeat business—to put in a self-interested note, or from a candid layman’s view, a money-making machine. Billions and billions served. People recognize McDonald's long-term business value not because its stock price soared, but because of its quality service and the endless huge profits it churns out. Its value is simply rooted in its fundamental business profits which is made consistent by continuously satisfying its customers' needs and wants. The long-term nature of a business can be rooted from the symbiotic relationship between the profit-motivated investor, and the ever-demanding customer who has unending needs and wants. This relationship leads to the creation of shareholder value driven by fundamental business profits derived from the sale of products and services intended to satisfy customers—the very essence of its internal wealth-generating faculty. Thus, the investor, as a buyer of business, should buy and 'consume' a stock for this intended purpose of owning it indefinitely (just like your family business, if you have one) and deriving gains from it through business profits (as opposed to a quick capital gain exploitation). This only gives him peace of mind and serves him well since fundamental profits, being derived from repeat business, are continuous, long-term, consistent, predictable, and ever compounding. It is only therefore apt to conclude that businesses are naturally long-term. Thus, stocks, by their very nature, are long-term. From a purely business perspective, the moment you buy a stock, what you immediately possess as a part owner or stockholder of that business is its current net worth, its equity, or book value. 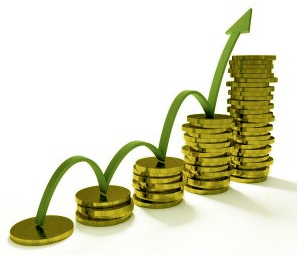 In addition to its present net worth, you also possess its earnings potential which is realized in the future. Premium is therefore understandable, but not to such extent it already escapes rational potency of earnings. Overpricing risks permanent loss of capital. Taking a feasibility and payback approach to stock investment, this valuation theory treats the buy price of a stock as an initial outlay. The investor, stoic to market price fluctuations upon entry, therefore, takes on the conservative position of eventually breaking even when book value per share, through comprehensive earnings and stock dilution/accretion gains, overtakes price. Upon breakeven, the investor’s rate of return approximates the Return on Equity (ROE). A cash register. The sound of a cash register is music to the ears of a business owner. There's nothing like than a business milking and realizing its profits in cold, hard cash, again and again. Due diligence comes naturally to an entrepreneur planning to start a new business. A business plan (complete with a feasibility study, a marketing plan, and an industry analysis) is a common tool. On the financial side, one tries to forecast the future cash flows spanning years (even more than a decade) and project an acceptable rate of return to justify the venture. The prospecting entrepreneur commits himself to the demanding undertaking for the long haul, and clearly understands the risks he is about to take given the business realities he observes. Instinctively, he is mindful of the initial outlay he has to recover and is very sensitive about the venture’s cash flow—he is bias of cash inflow and would not easily settle for booked sales made on credit; he loves the sound of the cash register. Likewise, he’s such a demon on cash outflow that when incurring costs, he tries to delay their payments as much as possible. He hates laying out more cash (especially significant spendings on equipments) than needed. After all, and ultimately, he intends to realize his profits in cash terms. No stock market, no prospect of trading capital gains, no distortion. The startup experience of an entrepreneur is so pure it’s such a given that financial gain can only be attained through business (marketing and operational) success. New York Stock Exchange floor traders. Pictures of adrenaline-driven traders shouting and pushing each other are a common stereotype of the stock market, definitely one of the popular culprits of Wall Street's infamous image. The wealth-generating faculty of a stock does not naturally derive itself, as notoriously perceived by many, from the prospect of capital gains by trading. 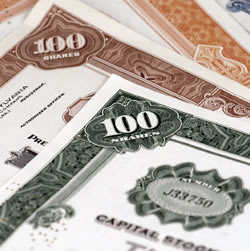 A capital gain is caused by stock market price fluctuations and is not an inherent feature of any business—this is but a result of the perceptions of market participants or the investing public which may or may not be aligned to the real value of the underlying business—it can be driven by folly, speculation, even manipulation. Even more surprising, when a company is listed in an exchange, most seems to think that the prospect of profits immediately become dependent on its stock price movements. It seems to have ceased functioning as a true business and that it magically possesses some other financial attribute which makes it more sophisticated, riskier, or sexier to the eyes. The essence of a business internally-generating profits through its operation, is easily overlooked or consciously dismissed. The Philippine Stock Exchange Makati trading floor. Most are still mysticized by the inner workings of the stock market when its basic underpinnings can be rooted to ownership of real, alive businesses. While one may initially perceive stock investing as a totally different matter from the idea of owning ordinary, real businesses, the truth is, they are, fundamentally and economically, the same thing. Of course, a sophisticated investor, arbitrageur, or short-term trader may immediately espouse that there are certain special considerations (e.g. legal qualities or market factors) inherent to stock ownership or trading that makes them quite different. But these things usually distract or confuse stock market investors from what should really matter most—that is, that stocks are, first and foremost, real businesses. This is what, I believe, the single, most essential paradigm to cause an investor to execute sound, long-lasting investments which consistently create wealth and compound value.